What if there were secret forces influencing our lives? Aliens operating behind the scenes, genetic supermen manipulating our politics, ancient secret societies seeking alliances with forces beyond time and space, mad scientists bending the fabric of reality. What if everyone believed that some of these were true, but no one could prove any of it? 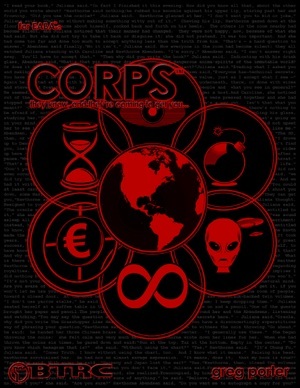 CORPS is a world very much like our own, but where all the conspiracies are real...somewhere. Adventurers have the dubious gift of being part of the realities that merely influence everyone else. They know the Apollo Program was a hoax...somewhere. The question is, why is it influencing people here, and how does it relate to the Lizard People? CORPS for EABA v2 is a reboot of the original conspiracy RPG, combining all the elements of the conspiracy genre into a single long-term plot the adventurers unwittingly become key players in, with nothing less than the survival of humanity in the balance. It is for fans of things like Warehouse 13, Special Unit 2, Sliders, Fringe, Planetary, Chronicles of Amber, the Illuminatus! trilogy or any other comic, movie, TV show or book based on a modern world, conspiracies and hidden realities. It is all of the above, yet none of the above, and the gamemaster gets to choose which of the major plots are real and which are merely red herrings to divert the adventurers from the sinister truth, making each campaign unique. This is an "advanced" gameworld. It may start off simple and innocuous, but juggling conspiracies and realities is not for the novice gamemaster. CORPS includes the same augmented pdf features as EABA v2, including interactive character sheets, in-pdf dice roller, pop-up navigation and full hyperlinking. CORPS includes augmented and "flat" versions of the rules (187 pages) and the Ridgefield introductory setting (15 pages). You can get a flat sample chapter of CORPS right here, or buy it from the link below. The sample setting and individual reference sheets can also be downloaded from the EABA free stuff page.